I was trying to get my solar output sensor to show as a bar chart. This sensor reports once a day and I wanted the chart to show 12 days output, one bar per day. The bar chart is accurate for the first 4 and the last 4 days, but the middle portion is somehow averaged? (History-graph is shown for comparison). Anybody tried to do a monthly graph? Is it possible that you don’t have correct data for those days? I do have correct data, which is rendered correctly by the history graph. But technically also the 4th bar is wrong, because in the history graph the 4th should be almost half of the previous barm how many “reads” are done each day? Cause maybe that’s the issue there, maybe a good FR should be havving “points_per_day” rather than per hour. Are you sure it only reports once a day? Judging by the graph it looks to be updating regularly and then reset once a day. (especially noticeable when looking at the last day). This won’t work well with this card, since the graph is based on a moving average calculated on the history data from each data point (24 hours in this case). Also, if you would open the UI with the graph in the middle of the day (12:00) for example, each bar will consist of history data from 12:00 a clock - 12:00 a clock previous day, while you are probably expecting it to calculate each day from 00:00-24:00. Anyway, I think you could make it work, but it would require some work. Kind of hard to explain but if you could make the sensor only report once at the end of the day (at the exact same time every day), maybe just before 00:00 and then also reset itself, I think it could work. The sensor would need to be updated at the exact same time every day though, if not, two updates could end up in the same 24 hour timespan. An easy workaround would be to set hours to show slight lower (286) but still have it display 12 bars, that way each day would be 23h50min and you have a 10 minute margin for the sensor to update. Also, there’s a bug with the bar chart atm, there’s an additional bar, the last (right) bar shouldn’t be there. 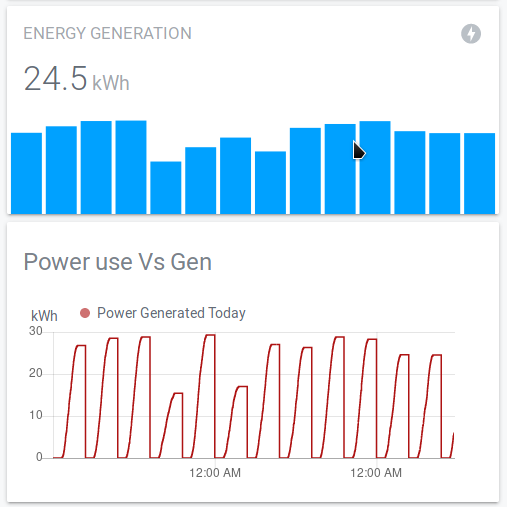 Is it possible to use the bar chart card for each bar to show watts consumption day? It’s possible, depending on how the sensor data looks. The graph is calculated by moving average, so not really suitable for such use cases but it’s possible. Read the post above for more details. Thank you for the wonderful cards! I love the updates in 0.3.0! Can u show an example? Sorry, I don’t have any sensors like that. I am having problem with this card. 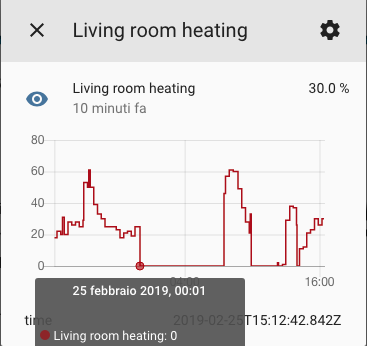 This is what i get using the sensor.living_room_heating. Problem is that at night (from 00:00 to 07:30) the sensor in /states shows always 0% as value, while in the card it shows always 16,5%. The thermostat is off between those hours. Why i don’t get 0% as the sensor says? Sounds like the sensor might be reporting something that’s not considered a number when it’s “off/0”, the graph would then ignore those history entries. But I would need access to the history to give you a definite answer. Hmmm i’m not so familiar in such things… I can wait if you can find some fix for this… sorry to not help you. This is what i get if i choose more infos about the sensor. I’m not able to recreate this issue, and I can’t fix it without having access to the history data. 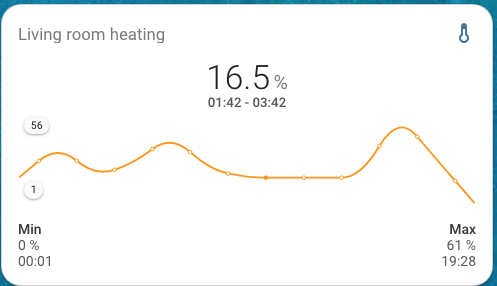 But… @maurizio53 also my question is… why/how would you measure heating in %? Is that the % of power the heater is providing?